Pastor Matthew Brant grew up in Iowa and earned his B.A. in History from Luther College in Decorah, IA, and his Th.M. from Dallas Theological Seminary. 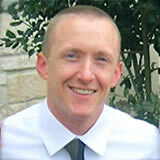 He completed his pastoral internship at Stonebriar Community Church in Frisco, TX. He enjoys running, classic literature, barbeque, and sports. His particular theological interests are ecclesiology, the Gospel of John, and the writings of St. Augustine and Dietrich Bonhoeffer. He and his wife, Molly, have four children.